Alright, you got me. I'm giving in. I'm making another one of these, and @--Jack-- seems to be fine with it. I talked to a few people about it on chat the past couple of days and figure interest is there, at least. At least I'll get something out of it myself too, meaning more experience with editing and organizing and refreshing skillsets, and having some constraints and deadlines for my own writing ideas. The only cost will be having to stick around and get somewhat invested, which will be a nice distraction for April-May on my end. 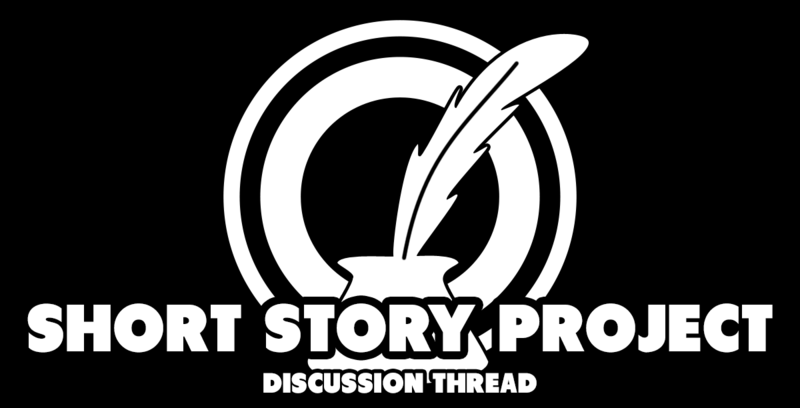 Anyway, this is the discussion thread for the writing project. If you've got no idea how these things usually go here, check the previous 6 projects. Five were organized by me, one by @--Jack-- (and well done at that), and they cover the basics. I'd also invite you to read the previous story collections (though I'll need to update the download links due to changes at dropbox; if they're down, let me know). A timeframe isn't set yet, though I'd like to get it going by mid April if possible, as I'm moving into a temp apartment around April 5th and will be bored out of my mind at home. We'll see how it goes. That phrase sprung to mind when brainstorming ideas on my own, and I ended up finding it quite enticing and open. But does it look exciting to you as well? That's what I'd like you to discuss here. The theme is not set in stone yet. Suggestions can be made, I'd like to hear them. However, give the proposed theme a good thinking 'bout. Of course, everybody is welcome to discuss and participate. Even if you don't expect to submit a story of your own, it is interesting to hear what you'd like to read! So there you have it. Discuss. A character that's dying perhaps? An end-of-the-world scenario or setting? Person taken to a world of aliens without return (a la Arthur Dent)? Big fan of that theme choice. I doubt I'll have the time to participate (Though I may attempt to despite that) but as a recurring theme in a lot of works of fiction that I find particularly interesting, I would certainly want to read as many of the entries as I can. Pinging @Rinneko, @BakaHime, @Sheep and @Enami. Also, does @Ucui still exist? I'd like to have him in this one again. Will just list down whatever came/will come to mind. I hope I somehow .... made sense. All I could think when reading that is something that related to mind-fuckery. Sounds like a vast subject to take in. Would be interesting. I would usually want to read something with a time-travel element in the plot, makes for setting up interesting twists and foreshadowing. Both simple and hard subject, if you really want to go full brainfuckery on it. We can both get some interesting stuff out of this, or some cookie-cutter end of the world stories. I'm sorry, people, but right now I'm not certain I'll be able to go ahead with this one. I need to reassess a few things for myself and I can't make this a priority. I won't outright cancel it, but I can't promise it'll get to the writing stage anytime soon or that I'll be able to edit submissions. @DarkChaplain I'm alive for you. @Ucui Thanks, buddy. I appreciate it. I moved to my temp-apartment today. Things went surprisingly smoothly, and even the net seems up to snuff. Everything's hooked up and working. The biggest source of ongoing stress has been dealt with, at least (which includes constant freakin' noise all day every day from construction outside my windows and in all 5 surrounding apartments. No construction near the temp place!). As a result of this and decent enough progress in other things that keep me busy, I believe that I can make this work as intended after all. So who's still interested in contributing? Any (serious) volunteers before I have to go and bully people into giving it a chance? I wonder, how is it that this thread is suddenly DC's journal on life's hardships? Count me out. Not interested in participating if organizer can't decide on his own promises. Had enough of that with Momi on the other project. If this one will go fine, I will perhaps join the next one. Alright, I'd like to discuss the timeframe now. My proposed start date would be next week, April 14, and the end date I think is realistic and long enough would be May 21st. That should allow people that are late to still have a final weekend to wrap up, and kicking off over a weekend seems like a good idea too. However, this is still up for discussion, so leave your feedback, please. I can't write lmao but I might join in maybe. Don't take my word for it tho, might rage quit after seeing first draft .-. Just saying, but all signing up now does is help me prepare the ebook template ahead of time and figure out how many people (and who) I'll have to prepare throwing encouragement grenades at for the coming weeks. It also helps encourage further participation from people on the fence. Formally signing up is not a requirement here; if anybody figures they can write something towards the deadline, they're free to submit it as well. It is not a closed call for volunteers. I am not sure if there'll be a Skype group or similar this time around to discuss and share though, since Skype's days seem numbered, so maybe a Discord thing might be more appropriate, if anything at all. We'll see. The proper project start thread will be going up on Friday I hope. It'll, like usual, detail the theme a little more and give specific info and requirements. I think we'll go with a range of 2000-8000 words again, though I'm considering some more wiggle room this time. Any feedback on this is appreciated, as always. I'll jump in then, tentatively.